Get the MOST out of Your Marriage! Whether you are married or plan to be, you can benefit from the biblical teachings and down-to-earth insight from experienced couples. "What God has joined together, let no man put asunder." 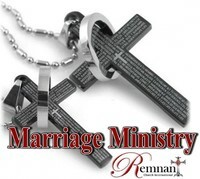 We at Remnant Church International hold fast to God first formed the family even before he formed the church. And for that reason, remnant church is a family first church. "Thus the core of the family being a man and women being joined in matrimony." The reality is that many in Christianity are struggling in their relationships, thus the necessity for Remnant Church International Marriage Ministry.